Explanation: This clear night skyscape captures the colourful glow of aurora australis, the southern lights, just outside the port city of Hobart, Tasmania, Australia, planet Earth. 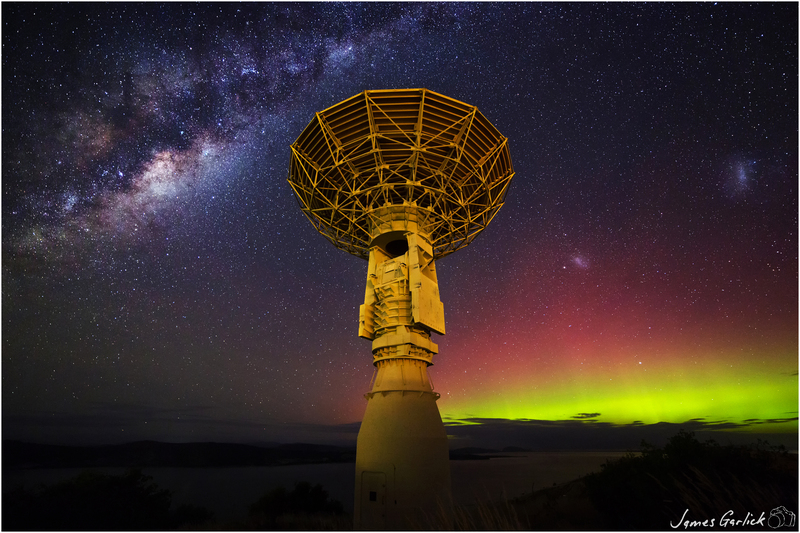 As if staring into the dreamlike scene, the Tasmanian Earth Resources Satellite Station poses in the centre, illuminated by nearby city lights. Used to receive data from spacebased Earth observing instruments, including NASA's MODIS and SeaWiFS, the station was decommissioned in 2011 and dismantled only recently, shortly after the picture was taken on April 30. Still shining in southern skies though, the central bulge of our Milky Way galaxy and two bright satellite galaxies the Large and Small Magellanic Clouds appear in the frame. The Small Magellanic Cloud shines through the fainter red auroral band.